Collect your Discount Card from Reception on Check In One per Booking Welcome to an original Margaret River experience. 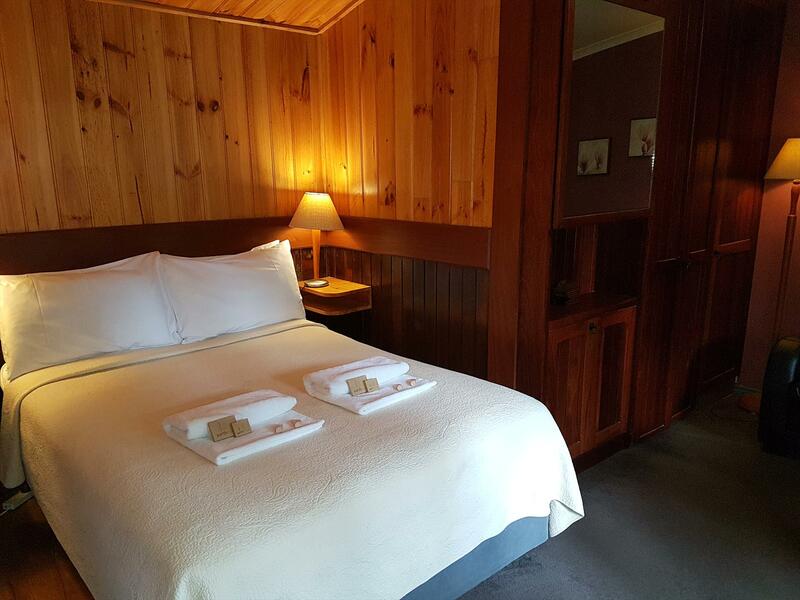 Bridgefield Guest House is a gracious heritage listed house situated in the main street of Margaret River town, within a short stroll of galleries, shops and restaurants, as well as river walk trails. 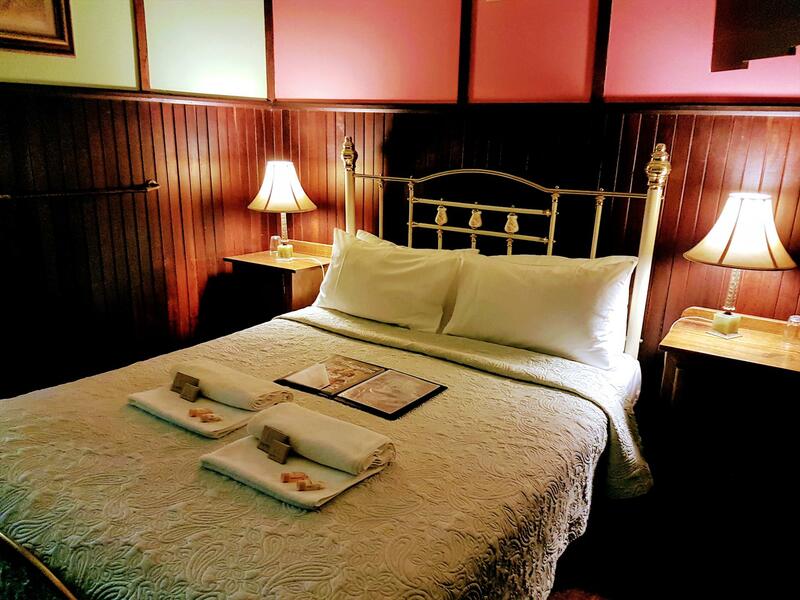 At Bridgefield Guest House, the beauty of the old includes the lovely warmth and romance of a winter log fire, matched by the modern comforts of reverse-cycle air-conditioning and individual ensuites with modern amenities including wireless internet. Bridgefield has seven guest rooms to offer, in the ambience of a gentler age. Bridgefield's Queen Rooms with ensuite have their own private covered garden courtyard, with individual tea- and coffee-making facilities. The cosy Cabin is free standing with a lovely patio area. For a little bit of extra indulgence, the Champagne Room offers a Spa and lovely Balcony. Downstairs from the Champagne Room, the Merlot Room adjoins a beautiful lounge area with Chesterfield lounges, a kitchenette and a pot belly stove for those cold winter nights. Two onsite restaurants - La Scarpetta Trattoria and Pizzica complete the ambience of your stay, both offering authentic Italian cuisine. Bridgefield provides opportunity both for contemplation and for meeting fellow travellers at leisure. 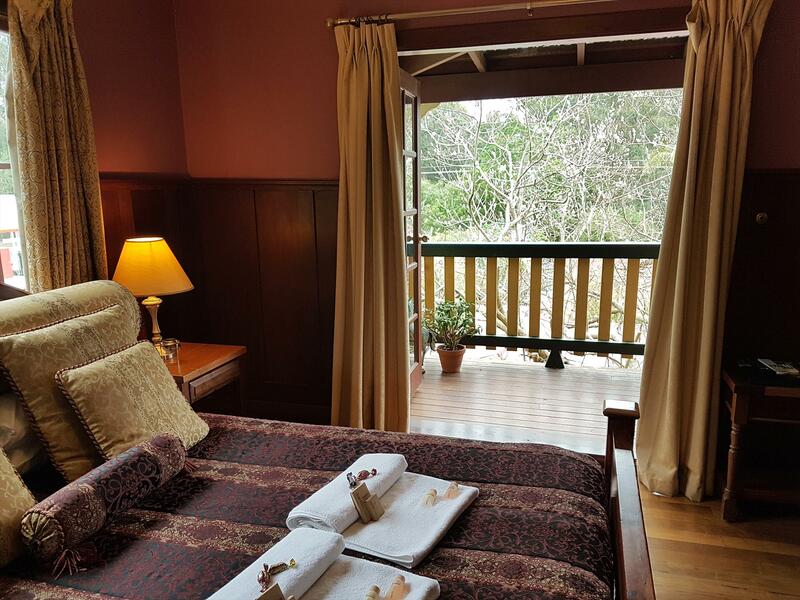 Splendid upstairs Queen room with access to charming verandah, beautifully appointed with rich wood panelling and ensuite with spa bath and separate shower. TV-DVD, dual control electric blanket, and tea and coffee-making facilities, Free WIFI , free parking. Reception at Adamsons Riverside across the road No check-in or check-outs on Xmas Day or New Years Day. 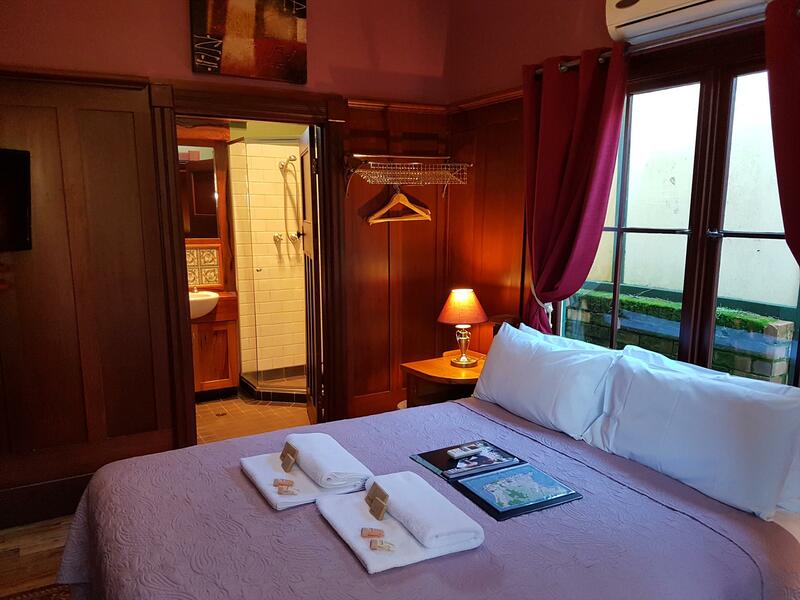 Recently renovated, this Queen room with ensuite with big brass bed and beautiful linen, with the modern conveniences of reverse cycle air-conditioning and dual-control electric blanket to ensure your comfort. Features an intimate private covered garden courtyard, with tea and coffee-making facilities and bar refrigerator. With the warmth from the Winter log fire in the guest lounge, your Margaret River experience will be a fully rounded and relaxing affair. Free WIFI , free parking. Reception at Adamsons across the road No checkin or checkouts on Xmas Day and New Years Day. The Merlot Room is a tastefully appointed, wood panelled queen room with ensuite situated on the ground floor in the Gallery Wing. Has TV-DVD, and private courtyard complete with pot belly stove and outdoor setting for two. It also has access to a large sitting room and kitchenette. The Merlot has reverse-cycle air-conditioning as well as electric blanket, and is perfect for the romantics at heart. Free WIFI, free parking. Reception at Adamsons across the road No checkin or checkouts on Xmas Day and New Years Day. 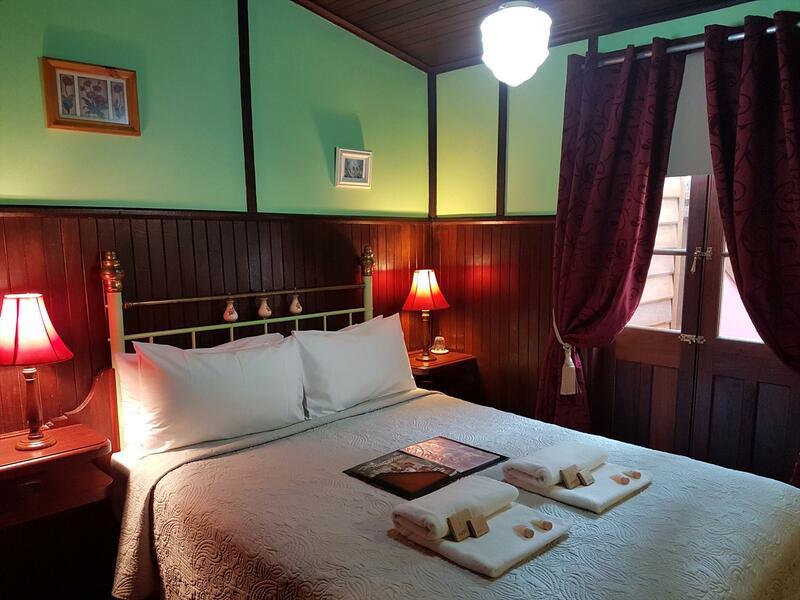 Bedroom with queen sized bed and ensuite including slipper bath, equipped with reverse-cycle air-conditioning and electric blanket. Free WIFI. Free parking. Daytime Reception at Adamsons across the road No check in or check outs on Christmas Day and New Years Day. Cosy quaint cabin a double bed and a sofa bed in one L-shaped bedroom, very suitable for a couple and a child or three adults travelling together. Features outdoor wooden deck with outdoor setting, small kitchenette and dining nook. Free WIFI and parking. Reception is at Adamsons across the road No checkin or checkouts on Xmas Day or New Years Day. Notice of 48 hours is required for cancellation. No fee will apply if the booked room is sold after cancellation. No check-in or check-out on Christmas Day or New Years Day.